Unique resumes have stylistic features or content that varies from more conventional documents. Some employers and industries are more open to creative approaches while others value traditional presentations. For instance, a graphic artist may benefit more from a unique resume than an actuary. It is important to align your application materials with the type of position you are seeking and try to stand out in the right ways. A resume with an unconventional design can still contain all of the information employers expect, including relevant skills and work experience. You might also want to incorporate content suited for a particular field or position or other relevant data that a resume does not typically have. There are also several ways to set yourself apart within the standard resume structure. Learn about unique resume templates and ways to breathe fresh air into any resume. Why Use Unique Resume Templates? Start creating your resume today using one of our unique template styles. A combination resume template can strike a unique balance between chronological organization and a skills-based functional resume. Most resumes include a mix of skills and work history, but you can arrange a combination resume to make the most of your strengths. These unique resume templates can be useful for candidates who want to present a full range of qualifications. A professional resume template may not seem like the most unique option, but you have a number of choices in how to go about presenting yourself. Depending on your field, your resume might include some unusual types of information or background. Other ways to make a professional document unique is to ensure that the layout you choose is as career-specific and efficient as possible. Just because a resume is basic doesn’t mean it can’t be unique. A striking minimalist design can be a great way to stand out without being outlandish. Other candidates may crowd their resumes, leading employers to consider a simple document that covers all of your strongest qualifications without any distractions or fluff to be refreshing. 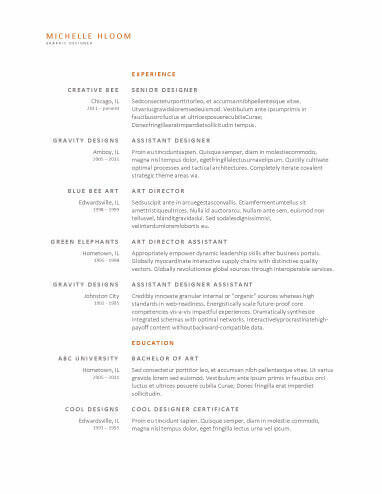 A contemporary resume design is likely to feature current aesthetics and approaches to presenting information. These timely templates may be ideal for applicants seeking positions involving design or user experience. A contemporary resume can indicate your ability to incorporate cutting-edge design principles into your work. Consider whether this style of unique resume templates could be suitable for the position you are seeking. A functional resume style emphasizes an applicant’s abilities more than his or her work history. These unique resume templates can be useful for entry-level positions or candidates who have changed jobs or fields. A functional resume can be an unexpected approach to resume writing because it places the emphasis on what you can do in the future rather than past experience. Unique resumes should still be informative. Even if you decide to change up the appearance or structure of your document, it is a good idea to account for the basic components of all of the standard resume sections. Name: Use your full name, as employers may create applicant or interview records based on the name on your resume. Email: Give a professional email address. It can be ideal if this address contains your name. Social Media: Depending on the position, you may want to provide a link to a professional social media account. Phone number: Opt for your cell or home phone number rather than any current or past work numbers. Mailing address: Simply mention your current city and state of residence or give a more detailed street or mailing address. Summary Statement: A summary statement is a newer way to start a resume with a brief overview of your major qualifications. This statement style usually consists of a series of short phrases that do not need to be complete sentences. The goal of a summary statement is to communicate what you can offer to prospective employers. Objective Statement: An objective statement is a more conventional resume section in which you declare your purpose for submitting a resume. This statement establishes what you are seeking in terms of employment. Order: Most resume styles structure the work experience section in reverse chronological order, starting with your current or most recent employment and continuing on to previous positions. Position: Provide a title for each position as well as the name and location of your employer and the dates that you held each job. Responsibilities: Every entry in your work experience section should include a list of duties and achievements. Bring up metrics or quantifiable measurements of your success wherever possible. Academics: Include all relevant degrees for the position you are seeking. If a job requires an associate’s or bachelor’s degree, there is no need to include your high school diploma. Professional Credentials: The education section of your resume is also a perfect place to bring up certifications and other occupational training. Writing a standout resume can be a challenge. You might want to look over our unique resume templates for ideas and then implement some of them within a more structured resume-writing environment. A resume builder can streamline your writing process. This tool makes it easy for you to generate a polished resume in a short time without unnecessary stress. Rather than struggling to decide on a format and include all of your information, there are several simple steps to completing a resume with a builder tool. There are several other advantages to using a resume builder.